(GOLDENDALE, Wash., February 13, 2018) — Maryhill Museum of Art will re-open for the season on March 15, 2018 with a special exhibition featuring 40 works by Richard F. Lack, one of the most significant and prolific American realists of the last half of the 20th century. 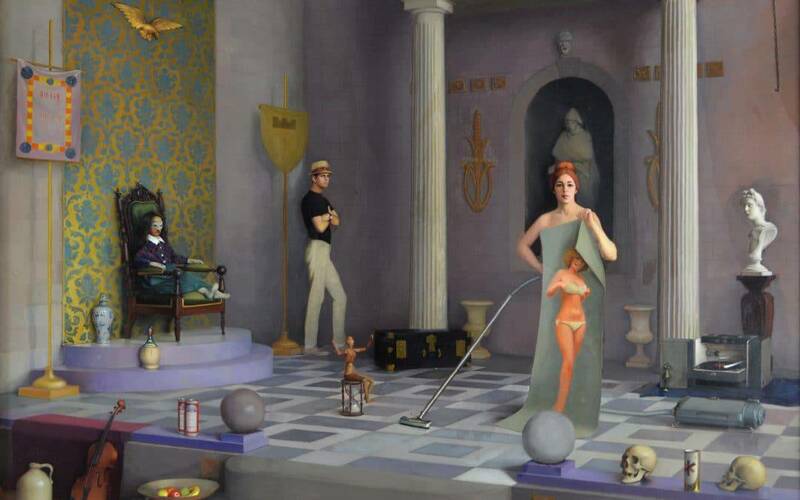 American Classical Realism will also be featured in a concurrent exhibition that includes work by R.H. Ives Gammell, Robert Douglas Hunter and Samuel Rose. Historic and contemporary European and American landscape paintings, and an exhibition of smaller sculptures, all drawn from the museum’s collection, will also be on view in 2018. A wide range of related programming for adults and families, including lectures, hands-on art workshops and special events will be offered throughout the year. Full calendar at www.maryhillmuseum.org. The paintings of Richard F. Lack (1928–2009) combine the form and drawing of nineteenth-century academic painters with the color and atmosphere of the Boston impressionists. His interest in classical painting traditions led him to the atelier of R. H. Ives Gammell, with whom he studied from 1950 to 1956. Lack and Gammell were proponents of “Imaginative Painting” and used the term to describe work that was previously designated as historical—or poetic—painting. It includes historical, religious, mythological, allegorical, fantasy, mystical and symbolic art. Curated by Stephen Gjertson, with assistance from The Atelier and the Lack Estate. Gjertson is a Minneapolis-area artist who was a student of Lack and a former teacher at his atelier. R.H. Ives Gammell (1893–1981) was one of the last American artists whose training traces back to the French academic tradition of the late eighteenth and nineteenth centuries. In 1950, he founded a Boston studio to ensure that the classical painting tradition would be preserved. In the early 1980s, one of Gammell’s students, Richard Lack, was asked to coin a term that would distinguish the work of the Boston realists from that of other representational artists. The idea of “Classical Realism” was subsequently articulated. Maryhill Museum of Art is home to a large collection of these works and this exhibition draws from that material. Work by Gammell and three of his students—Richard Lack (1928–2009), Robert Douglas Hunter (1928–2014) and Samuel Rose (1941–2008)—may be seen in the exhibition. This exhibition showcases landscape paintings from the museum’s collection, including historic and contemporary European and American works, and recent paintings from the 2016 and 2017 Pacific Northwest Plein Air in the Columbia River Gorge events. On view are 20 small sculptures from the museum’s permanent collection. Highlights include Art Deco ceramics by Seraphin Soudbinine, bronzes by French artist Théodore Rivière, and The Wretched by Meta Vaux Warrick Fuller. In addition to the special exhibitions mentioned above, the museum has permanent exhibitions of more than 80 works by Auguste Rodin, European and American paintings, objects d’art from the palaces of the Queen of Romania, Orthodox icons, a display of more than 75 chess sets from around the world, and the renowned Théâtre de la Mode, featuring small-scale mannequins attired in haute couture fashions of post-World War II France. The museum’s Native American Gallery features works of art from prehistoric through contemporary, with a particular emphasis on tribes from the Pacific Northwest. The exhibition Sam Hill and the Columbia River Highway shows historic construction images and early scenic views of the Columbia River Gorge.